"This is a good basic recipe for a side dish for Chinese BBQ pork. Add or subtract any vegetables of your choice. As a main course, try adding cooked shrimp, chicken, or pork. Always prep and measure all ingredients before you start to cook! Serve with egg drop or wonton soup and an egg roll." Heat oil in a large wok or skillet over medium-high heat. Cook egg in hot wok, stirring continually, until no longer moist, 3 to 5 minutes. Transfer egg to a plate and return wok to heat. Cook ginger and garlic in skillet until fragrant, about 1 minute. Add teriyaki sauce, lime juice, brown sugar, salt, and red pepper flakes to the ginger and garlic; bring to a boil, reduce heat to medium, and continue to cook another 2 minutes. Crumble cold rice into the wok. 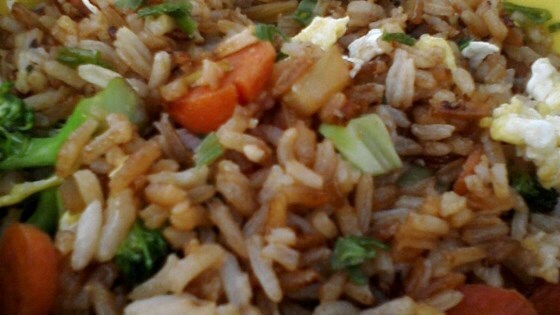 Stir rice with a wooden spoon, breaking rice into individual grains as it warms; add peas, carrots, broccoli, and green onion. Cook and stir mixture until the vegetables are tender, 7 to 10 minutes. Fold scrambled egg into the rice mixture; cook and stir until egg is reheated, 1 to 2 minutes more. See how to turn leftovers into a fast and delicious meal. Made according to the recipe, except used tamari instead of teriyaki sauce, and sugar snap peas. Came out great! First time I made it = good Each time I have made it after that = Best Ever! I like to put different veggies in each time. I want to try shrimp next time. Best rice I've made so far! Put more veggies than called for but more is better in this case.